In addition of the Cherry Mobile Omega Icon, the company released a smartphone that features a 5 inch IPS panel with High Definition resolution and OGS (One Glass Solution) technology for ₱5,999, the Omega Aeon. The Aeon is powered by Qualcomm MSM8212 Snapdragon 200 processor clocked at 1.2GHz with 1GB of RAM in a 5-inches display that has an OGS technology. Carries a 13 megapixel main camera with BSI and LED flash, it also has a 5 megapixel camera on front thats good for taking selfies. 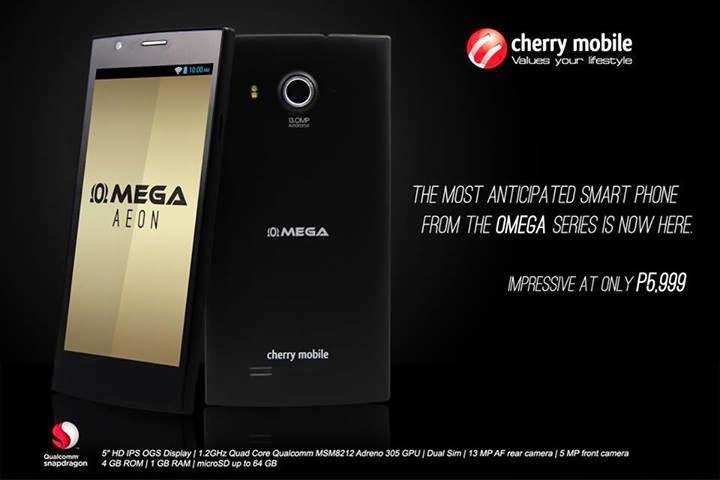 The Cherry Mobile Omega Aeon is now available in all Cherry Mobile kiosk, stores and dealers for ₱5,999.